Screenfetch provides useful information about your computer and your operating system within a terminal window. Screenfetch is available in the repositories of most Linux distributions. Note that for Debian you won't need to use sudo unless you've specifically set it up. If you are using Ubuntu then you may receive an error about a missing GLIB. The way to fix this is to install python-gobject-2. To get rid of the error, type sudo apt-get install python-gobject-2. Hostname: Current hostname of your computer. Operating System: Name of the operating system. Kernel Version: The OS kernel version. Uptime: How long the system has been up and running. Number of installed packages: How many apps you've installed on the system. Shell version: Current version of the shell. Screen resolution: Your display's current resolution. Desktop Environment: Currently installed desktop environment (DE). Window Manager: Currently installed window manager (typically part of the DE). Window Manager Theme: The current theme you've chosen inside of the Window Manager. GTK Theme: Currently installed graphical user interface (GUI) toolkit. Icon Theme: The icon theme you've installed for your DE. Font: The font you've enabled for your DE. CPU: Your system's CPU model and speed. RAM: Your system's RAM size. You can get the screenfetch information to appear every time you open a new terminal window by adding it to your bashrc file. This command checks for the existence of screenfetch in the /usr/bin directory. If screenfetch is there, it'll run. Press CTRL + O to save the file, and then CTRL + X to exit the file. Now, whenever you open a terminal or use a different TTY, the screenfetch information will appear. The number of desktop managers and windows managers that can be detected by Screenfetch is limited as well. For instance the desktop managers are KDE, Gnome, Unity, Xfce, LXDE, Cinnamon, MATE, CDE and RazorQT. Screenfetch has a number of switches which you can use to show and omit information. For example, if you don't want to have a logo displayed, use screenfetch -n. The reverse of this would be to just display the logo without information. You can achieve this by using screenfetch -L.
Other switches include the ability to remove color from the output (screenfetch -N) and the ability to show the logo first and then the information underneath (screenfetch -p). You can get screenfetch to display the information as if you were running a different distribution. 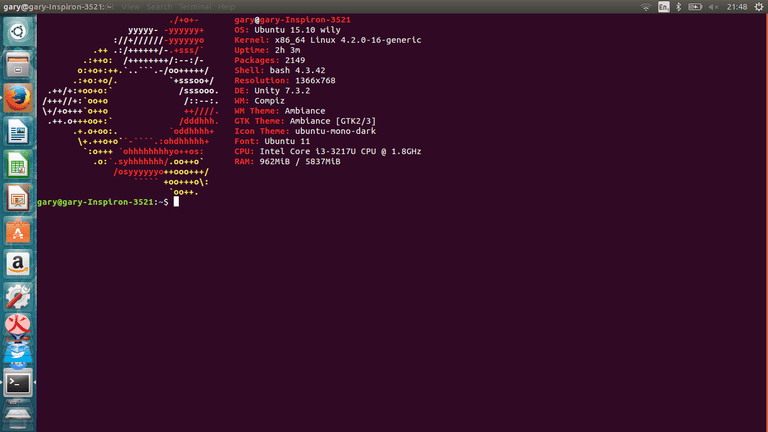 For instance, if you are using Ubuntu but you want screenfetch to show the Fedora logo and information. There may not be many cases where you would want to do this, but the option is there if you wish to use it. You can use screenfetch to take a screenshot by using the -s command line switch. Note that this takes a full screenshot and not just the terminal you're using.